Hero MotoCorp is known to make a big splash at the Auto Expo, showcasing a host of new products either in concept or ready to launch forms. The 2018 Auto Expo will be no different, but the showstopper at its stall this time will be the XPulse 200. The XPulse 200 broke cover at the Milan Motor Show aka EICMA last year and has garnered a huge response. Technical specifications weren't revealed back then, but now we know that the XPulse will borrow the 200cc, air-cooled single cylinder engine that powers the recently showcased Xtreme 200R. The Xtreme 200R will of course be showcased at the Auto Expo, but the XPulse 200 will be a bigger draw since this is the first time the bike will be showcased in India. The rising popularity of adventure touring segment of motorcycles has created the demand for an affordable, entry-level on/off-road motorcycle, which is what the XPulse 200 is. Expected to launch later this year, the XPulse 200 will thus give birth to an all-new segment in the country, one that is expected to grow rapidly. 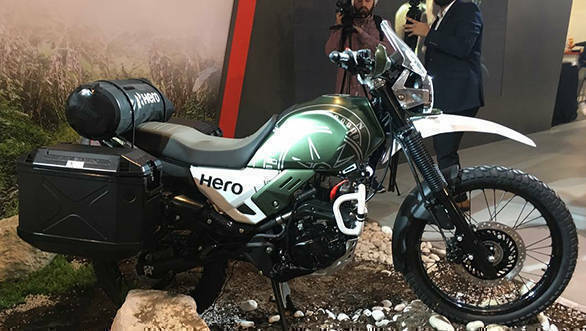 We expect Hero to reveal more technical details about the XPulse 200 at the 2018 Auto Expo. The engine could be in a different state of tune as compared to the Xtreme 200R where it produces 18.4PS and 17Nm. Outputs could be lower on the XPulse and the engine could boast beefier low end performance along with relatively lower top end grunt given the positioning of the XPulse as a motorcycle meant to be ridden off tarmac as well.